Embarrassing relatives. We’ve all got them. Whether it’s an uncle who makes off-colour jokes and is a little too free with his hands or the aunt who only drinks on Christmas Day and, after two sherries, insists everyone watches a war film instead of the great comedy show on the other channel, then promptly falls asleep and starts snoring at seismic levels… OK, this analogy might be getting a bit too personal. I feel like that about some of my fellow Town fans sometimes. We all have the same interests at heart, but – naturally enough – have different views about how to go about achieving our aims. We argue, we fight, we agree to differ, it doesn’t last long, we argue again… . It was ever thus. In many ways, it’s that kind of thing that makes football supporters comparable to a real family, rather than the trite, happy-clappy, “football family” of the clichés that are trotted out by the media, Barclays ads and football club PR departments. Perhaps the rivalry between the two major East Anglian clubs is a bit like a confrontation between the Montagues and the Capulets in Shakespeare’s Romeo and Juliet, except that fortunately, for the most part, the sword fighting has been replaced by verbal abuse and bragging in musical form. This is clearly an improvement, and anyway the police will no doubt deal with anyone on either side who allows the rivalry to spill over into anything worse. 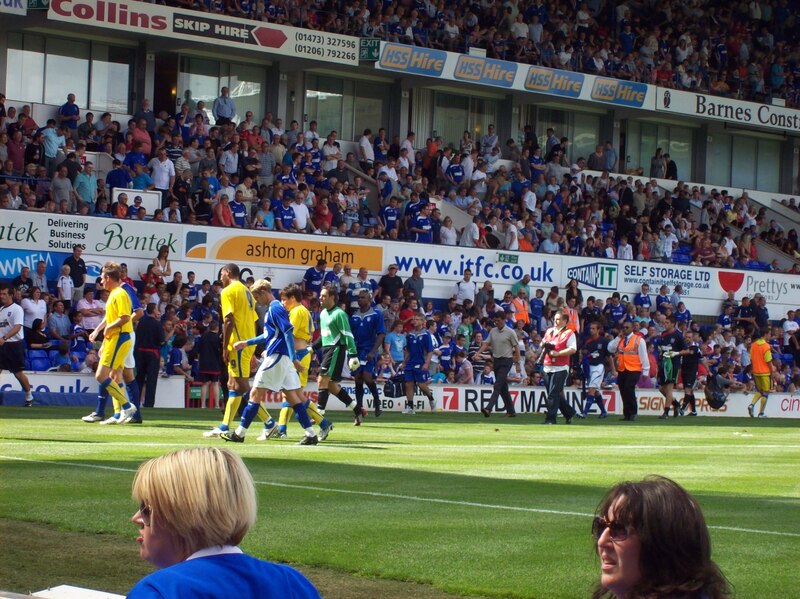 However, there are aspects of some of the chanting that Ipswich fans aim at their rivals that aren’t acceptable. If they ever were acceptable – and I doubt it – they aren’t any longer. Stuart Hellingsworth wrote about that, with particular reference to the appalling Justin Fashanu song. I don’t know any Ipswich Town supporter who isn’t embarrassed and ashamed about that being sung and I hope that I never hear it at Portman Road again. It does, of course, contravene the law and our own club rules and anyone caught singing it will, quite rightly, be thrown out of the ground and banned. There’s another song that crosses the line of acceptability though, and one of the Turnstile Blues group unfortunately heard about twenty fans singing it in the North Stand in the match against Fulham recently. It’s the one about Delia. I’m not going to quote the words as they’re well known. The objection here isn’t to “bad language” though. The issue is that people are singing a song that is intended to be offensive about the Norwich City “joint majority shareholder” (that’s what she’s officially called and that is silly. Perhaps someone could come up with a song?) They’re singing it for one reason alone, because she’s a woman. Whatever our views on Delia, her gender isn’t really relevant and shouldn’t be an issue. The only conclusion that anyone can reluctantly come to is that the song is sung because there’s a – hopefully small – element in the Ipswich Town fan base that is sexist and/or misogynistic and this is a manifestation of it. Football has grown up a lot over the last few decades, but it’s quite clear from the revelations about TV presenters Richard Keys and Andy Gray, Richard Scudamore, the Chief Executive of the Premier League, no less and – as recently as yesterday – allegations about former Cardiff City manager (and Norwich player), Malky Mackay, that there’s still a long way to go. Recent advertising campaigns by The Football Paper, and Conference sponsors, Vanarama, are depressing in their out-dated attitude to women. It all seems to be based on an outmoded view that “lad culture” is the norm and that this kind of thing appeals to most football supporters. That’s as insulting to men as it is to women when you think about it. Look around most football grounds now and you’ll see lots of women, you’ll see families, you’ll see men with daughters (and sons) who don’t want to hear things like the Delia song. It’s disappointing that sexism and misogynistic behaviour don’t seem to be taken as seriously as racism and homophobia, but it’s just as bad. Denigrating someone because of what they are rather than who they are, or because of a stereotype, is exactly the kind of thing that leads to worse: hatred, abuse, violence. Denigrating someone just because they’re female, apart from being quite weird and ridiculous, is pernicious. We’re all hoping to see our status as the Pride of Anglia restored on Saturday. Whatever the result, let’s hope that the most embarrassing members of the ITFC family stay at home or keep their malignant songs to themselves. You can report any offensive chanting or language using the Kick It Out app or the club’s STAMP IT OUT text number 07834 439429. This entry was posted on Thursday, August 21st, 2014 at 5:10 pm and is filed under Football, Ipswich Town Football Club. You can follow any responses to this entry through the RSS 2.0 feed. You can leave a response, or trackback from your own site.